I finally made the trek out to Berkeley during my most recent Bay Area trip and took photos of my favorite hot dog of all time at Top Dog. I'm usually not a hot dog lover by any stretch and I frown when my partner shows a weakness for fast food. But this isn't fast food in the Fast Food Nation sense. It's the kind of dog whose quality you could vouch for. Top Dog prides itself in getting different sausages from the best vendors such as Molinari and Saag's. I've tried most of the 11 kinds offered from the classic all-beef Top Dog to the healthier Lemon Chicken option but my perennial favorite is no doubt the Louisiana Hot Link, made of pork and beef and the spiciest of them all. The photo above certainly doesn't do it justice. The combination of the nicely warmed bun, the perfectly charred and juicy dog and the condiments is phenomenal. I'm a sauerkraut-kind-of person and boy, Top Dog has one mean sauerkraut. 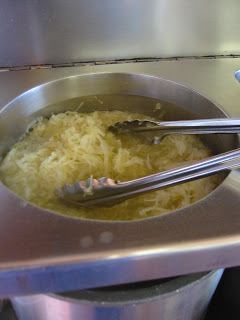 Top Dog practically turned me into a sauerkraut convert -- who knew piping hot fermented cabbage could look so inviting! Not to undermine the importance of good mustard to finish off the toppings, Top Dog has at least three mustards to choose from depending on your heat tolerance. I like to have it with the mild mustard because the Hot Link is already pretty darn hot. The first bite into the sausage as it squirts yummy, spicy juices is so satisfying. Add the bread, sauerkraut and mustard and you're in heaven. Chopped onions are also available but I think they merely distract. It's the perfect snack, at $3 a pop (it used to be $2.50 for the longest time) and you have to love the joint's decidedly anti-establishment messages wallpapered throughout its tiny space. I have had many debates about whether the original Top Dog in the Durant location has the best-tasting dog because of its weathered, aged griddle. I think it does. When I went to Germany for the 2006 World Cup, to say I had overdosed on those ubiquitous bratwursts by the time I left three weeks later is an understatement. I was done, no more, nein danke. I swore I wouldn't have another hot dog again at least until the next Cup. Sure, a bratwurst is no Hot Link. 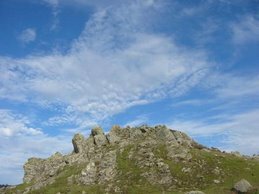 But it's remarkable that the minute I saw Top Dog on the horizon, all traumatic memories of eating one too many bratwursts squeezed alongside those crazed, face-painted football fans whizzed away and the smell of hot dog on a griddle was irresistible. We once bought the sausages and buns and served them to our friends and family at a beach-side barbecue to rave reviews (veggie dog available). It also helps that the place stays open late. The original shop closes at 2am (3am on Fridays and Saturdays) -- right around that time you hanker for something to get you going for the rest of the night to study for that exam or hop onto the next party (or just sleep). Pink's or other hot dog joints in LA don't do it for me. I think Pink's is horrible and have yet to sample one here that's comparable to Top Dog. I was excited to see U-Dog in Westwood try a similar concept a few years ago but it didn't come close and it, well, closed (it is now a falafel place). Note to self: Must try the hot dog cart in Culver City that J Gold mentioned a few weeks ago. as a freshman at berkeley, there were two things that made life tasty despite two conflicting pressures: my limited budget and my big appetite. the first place was kim's super burrito. the hard-working owners of kim's super burrito deservedly retired in the 1990's. their $1.99 veggie burrito lives on in the memories of the many students who gratefully devoured their perfectly steamed creations. we recently went to the second place, top dog, and it's still the same experience. i smelled the dogs cooking and my mouth started watering well before we entered. the dude behind the counter, who's been there forever, asked us what we wanted. we ordered two hots (hot links), our favorite. while waiting for the dogs to cook, we paid, received our free waters, and read the mish-mash of left wing, libertarian, socialist cartoons and messages that cover the walls. always interesting stuff. the dude called out that our hots were ready. i picked mine up and went straight to the condiments. i thought i was still a freshman and went a little crazy: went hot on hot. i added the spiciest, russian mustard to my already spicy hot link, and topped it off with sauerkraut and onions. 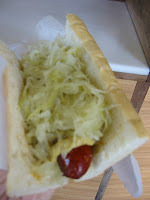 the first, big bite was an explosion of juicy link, crazy hot mustard, tangy kraut, a hint of onion, followed by the soothing flavor of toasted bread and many years of memories. the hot-hot combo was tasty but it hurt. so what did i do? i chased it down by ordering another hot link of course. this time, however, i topped it with ketchup and relish. my kind of dessert. for those who have never had a top dog, hope you make it there one day. for all others, let the dog live on. There's just something about the sausages, kraut, and mustard there that's incomparable. And of course what could be better with a 'dog than a wall full of Libertarian rants -- mostly directed against the Berkeley City Government. Long Live Top Dog. Top Dog is THE BEST. I have so many fond memories of the place, hope it stays around forever. It's my favorite sausage place! 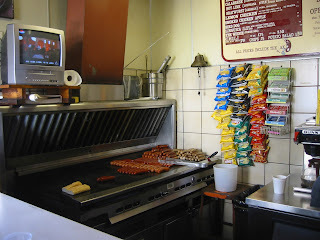 If you ever venture to Melbourne, Australia, try the brats and other sausages at my second-favorite sausage place--a little stand run by a Korean-Australian family in the Queen Victoria Market (close to the tea stand). If you still have room in your tummy, have a coffee scroll (similar to a big cinnamon roll) for dessert or bring it home for later.